The Shawnee Inn and Golf Resort’s Evergreen House offers the finest in overnight accommodations. 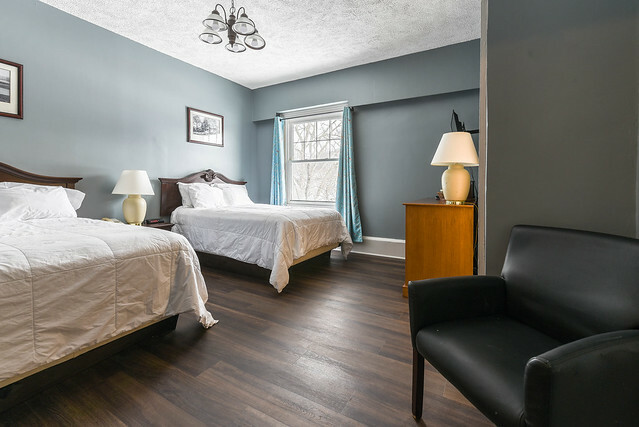 Our Evergreen House is one of our newest renovated accommodations and is only steps away from the Delaware River. This premium cottage features modern décor and has four separate quarters with six total bedrooms and six total bathrooms that can be sold separately or as a whole unit to accommodate parties up to 24. Video-on-demand by MovieBeam is available for an additional fee. The Evergreen House includes air conditioning and heating, keeping the atmosphere comfortable no matter the time of year. Handcrafted Shawnee soaps and shampoos are also available in the bathrooms. Turn down service is also available. This premium Poconos cottage also features television with DirecTV® videos-on-demand by MovieBeam™. Guests at the Evergreen House will have access to bell service, concierge, and other services at The Main Inn. After a day of exploring, take a relaxing dip in the indoor pool. Or visit the onsite Shawnee Spa for a day of pampering. Guests also have access to the business center and the fitness center. The Evergreen House is a great destination for families, groups, outdoor enthusiasts, or anyone looking for a Poconos cottage getaway!